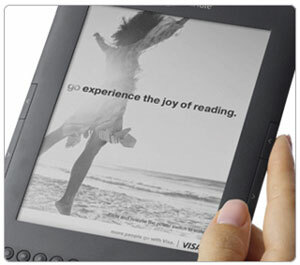 Amazon is offering a $25 discount on the hugely popular Kindle , dropping the price to only $114. But there's a catch...a big one. The discounted Kindle serves up "special offers" and sponsored screensavers on the Kindle screensaver and at the bottom of the home screen. According to Amazon, Kindle owners will be able to vote for the screensavers they like most, but not the advertisers that show up on them. And there's no way to turn the ads off, though they only show up on the home screen and screensaver, not while reading. Initial sponsors will include Buick, Chase, Olay and Visa. Amazon suggests they will also be providing ads of their own, such as a $20 Amazon gift card for $10 and an album from the Amazon MP3 store for $1. While everyone likes a discount, $25 doesn't seem like enough to justify the annoyance of the ads. Like many, I enjoy immersing myself in a book to get away from it all. And a Chase credit card ad just doesn't contribute to that experience. The discounted Kindle will be available on May 3rd and can be pre-ordered now. I’m looking to eventually buy a Kindle, but this would not be something I’d get. Ads annoy me any time, and like you, I read to get away from all that. I’ll just keep getting those $5 Amazon cards from swagbucks twice a month.